This infrared image, taken by NASA's Spitzer Space Telescope, shows a part of the galaxy cluster Abell 2667. 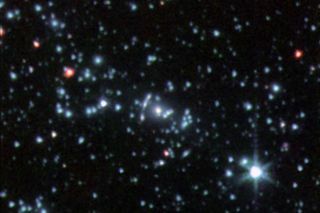 The "Comet Galaxy" is the bright red object seen to the left of the cluster center. Astronomersare watching a galaxy rip to shreds,a finding that could help reveal how galaxies go from stellar riches to rags. Whilelooking at the galaxy cluster Abell 2667 with the Hubble Space Telescope,scientists found a spiralgalaxy which they nicknamed the "Comet Galaxy." The gas andstars of the Comet Galaxy--movingthrough the cluster at speeds of more than 2 million mph--are being strippedaway by the tidal forces of the cluster. Also, the pressure of thecluster's scorching gas plasma--known as ram pressure stripping--is adding to thedamage. "Thisunique galaxy, situated 3.2 billion light-years from Earth, has an extended stream of brightblue knots and diffuse wisps of young stars driven away by the tidal forces andthe ram pressure stripping of the hot dense gas," said Jean-Paul Kneib, a studycollaborator from the Laboratoire d'Astrophysique de Marseille. Galaxiescome in many shapes and sizes. Elliptical galaxies generally have little gasand dust and mainly consist of old stars. Unlike spiral galaxies, which aregenerally found in isolation, elliptical galaxies are spotted in the center ofcrowded galaxy clusters. Up untilnow, it's been a mystery as to how a gas-rich spiral galaxy evolves into a gas-poor irregular galaxy or a gas-poor elliptical galaxy. Also, when the Universe was half its present age,only one in five galaxies was a gas-poor elliptical galaxy. This has leftastronomers wondering where all of the present day elliptical galaxies camefrom. Ellipticalgalaxies, scientists suspect, are transformation products of other types ofgalaxies, something no one has seen because the process takes billions ofyears. What they are observing now is some 200 million years into such aprocess. "Bycombining Hubble observations with various ground- and space-based telescopes, we have been able toshed some light on the evolutionary history of galaxies", said study teamleader Luca Cortese of Cardiff University, UK. The CometGalaxy--with a little more mass than the MilkyWay--will eventually lose its battle against the tidal forces and pressuresof the hot plasma acting on it and end up a gas-poor galaxy with a collectionof old stars. "Millionsof now homeless stars have been snatched away from their mother galaxy, whichwill lead the galaxy to age prematurely," said study co-investigator GiovanniCovone of Osservatorio Astronomico di Capodimonte.